Benjamin Reinhart has a BS in Mathematics from the University of Maryland. His specialties are statistics and game theory and how they relate to interactive design. 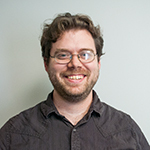 As a Web Developer at Clinical Tools, Benjamin helps create and test serious games and applications that improve medical education and public health. In his free-time, Benjamin designs and plays tabletop games.